Straightening is my particular skill which I perfected making cane furniture all those years ago. You know in years to come when I have passed on, if my name occurs in conversation, I won't be noted for my piercing wit, elegant dress sense or sporting flair but "by golly he could straighten a stick" - that will be my epitaph. Woodworm, sadly, if present don't wake up from their first and last sauna treatment in the steamer. I have a love/hate relationship with stick hunting, joy comes with spotting a beautiful stem or shank arising cleanly from a sturdy root or branch. Misery from spending too much time in the most dismal, derelict copses and thickets in foul weather. There is no way I am ever going to use all the sticks I cut so I may as well start passing them on. My experience of mail order has taught me the importance of accurate adverts, swift deliveries and good packing rest assured. Incidently I would love to recieve photos via email of my blanks you have transformed into a work of art/craft. 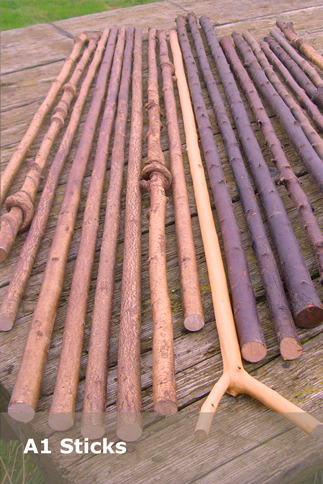 Walking stick blanks for amateur or professional stick carvers.